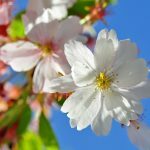 If you’re looking for a flowering tree to accent your garden, try growing a Snow Fountain cherry, Prunus x ‘Snowfozam.’ What’s a Snowfozam tree? Read on to find out how to grow a Snow Fountain cherry and other useful Snow Fountain cherry info. 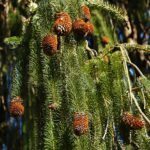 What is a Snofozam Tree? 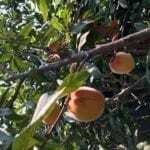 Snofozam, sold under the trade name of Snow Fountain, is a deciduous tree hardy in USDA zones 4-8. With a weeping habit, Snow Fountain cherries are stunning in the spring, covered with their showy, brilliantly white booms. 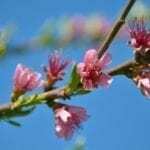 They are members of the family Rosaceae and the genus Prunus, from the Latin for plum or cherry tree. Snofozam cherry trees were introduced in 1985 by Lake County Nursery in Perry, Ohio. They are sometimes listed as a cultivar of P. x yedoensis or P. subhirtella. A small, compact tree, Snow Fountain cherries only grow to about 12 feet (4 m.) tall and wide. The tree’s foliage is alternate and dark green and turns gorgeous hues of gold and orange in the fall. As mentioned, the tree bursts into bloom in the spring. Blossoming is followed by the production of small, red (turning to black), inedible fruit. The weeping habit of this tree makes it especially stunning in a Japanese style garden or near a reflecting pond. When in bloom, the weeping habit dips down to the ground giving the tree the appearance of a snow fountain, hence its name. Snofozam is also available in a low growing form that makes a lovely ground cover or can be grown to cascade over walls. Snow Fountain cherries prefer moist, moderately fertile, well-draining loam with full sun exposure, although they will tolerate light shade. Prior to planting Snow Fountain cherries, work some organic mulch into the top layer of soil. Dig a hole as deep as the root ball and twice as wide. Loosen the tree’s roots and carefully lower it into the hole. Fill in and tamp down around the root ball with soil. Water the tree well and mulch around the base with a couple of inches (5 cm.) of bark. Keep the mulch away from the trunk of the tree. Stake the tree for the first couple years to give it additional support. When growing a Snow Fountain cherry, once the tree has established, it is fairly maintenance free. Water the tree deeply a couple of times a week during any lengthy dry spells and less if it rains. Fertilize in the spring at the emergence of buds. Use a fertilizer that is made for flowering trees or an all-purpose (10-10-10) fertilizer according to the manufacturer’s instructions. Pruning is generally minimal and used purely to retard the length of the branches, remove ground shoots or any diseased or damaged limbs. The tree takes well to pruning and can be pruned into a variety of shapes. Snow Fountain cherries are susceptible to borers, aphids, caterpillars and scale as well as diseases like leaf spot and canker. 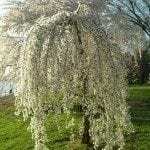 Read more articles about Weeping Cherry.